Nathan Gelgud's New York Film Review: Frownland is Coming! 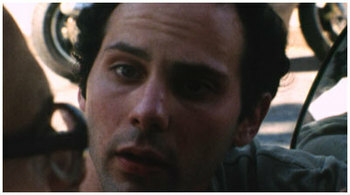 After a scorching premiere at South by Southwest Film Festival, a very anticipated (in admittedly very small circles) film is crawling into New York tomorrow night -- Ronald Bronstein's Frownland. Frownland is a comedy without jokes -- a melee of a movie, really -- about Keith, a door-to-door coupon salesman and self-described "troll who came out of the water." Every word that he says is garbled with interminable and unnecessary apologies, kaleidoscoping quotidian exchanges into Mad Lib collages of stammers and grunts. His neuroses reach extremes verging on self-annihilation. He's an artless con artist, running the coupon scam with hilarious ineptitude. "My father died of a heart attack," he tells a customer, trying to develop rapport, before adding "I hadn't seen him for six years, it wasn't that painful." While he's been making the movie, Bronstein has worked as a projectionist of the precious and obscure at Anthology and MoMA. Fascinating, then, that he's made something so intent on tearing the preciousness away from art movies. Who knows if the destiny of Frownland is one of obscurity, though, so you'd be well-advised to take this opportunity to see one of the best American films of the past year at 2nd and 2nd tomorrow night at 8:30.